In this article, I present a visual guide to building and deploying a C# COM (Component Object Model) Interrop DLL (Dynamic Link Library) for APL using Visual C# 2005 Express Edition. This is not a tutorial on either C# or on Visual C# 2005 Express Edition, but simply an illustration of the process for building COM DLLs in C#. For a limited period and subject to conditions, Visual C# 2005 Express Edition is available as a free-download, together with installation instructions . The continuing evolution of the .Net platform has spawned a lot of documentation on the internet which appears to be misleading, at least from an APL point of view; a contributing factor in this confusion is that the documentation applies to several versions of the .Net framework and Visual Studio.net. This article redresses the situation by providing a template for building COM DLLs for APL. The actual code in the DLL is of a trivial nature and intended solely to illustrate how to build it. A COM DLL is a server to a client; in the present context, the client is APL. The COM server exposes methods, properties, and events that the client can use irrespective of the native language of the DLL. In order to deploy such a DLL, the target computer must have the .Net Framework 2.0 installed; this is available as a free download . Visual Studio.Net 2005 uses the same framework and although the interface presented by the Express and full versions are different, it is possible to use Visual Studio 2005 instead of the Express edition. This article is based on the Express edition. Start the Express edition and click File|New Project. Figure 1 shows the dialogue that appears. 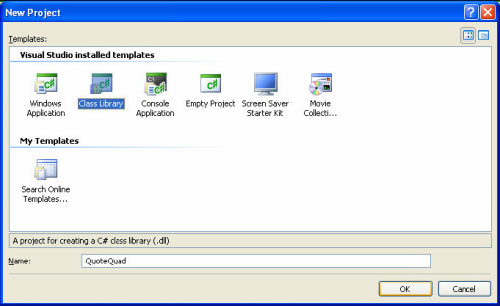 Select the Class Library template and specify the name as QuoteQuad, as shown above. This ensures that QuoteQuad is the name of the DLL. By default, the class library is not configured for COM usage. In order to modify the properties of the DLL to enable it for COM, click View|Properties Window and then select Class1.cs; the objective is to change the class name. Figure 2 shows the class name after class1.cs has been renamed Demo.cs. Clients will instantiate the DLL by using the Library.Classname convention; in this context, the reference is QuoteQuad.Demo. Next, click Project|Quote Quad Properties; this step is shown in Figure 3. Next, Figure 4 shows the screen that becomes visible. 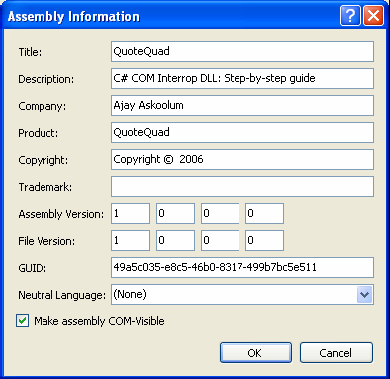 Click Assembly Information in order to display the dialogue shown in Figure 5. Tick the Make assembly COM-Visible the option. Next, click Build in the left pane and specify the output path and tick Register for COM interop as shown in Figure 6. For Location specify the fully qualified name of the location and then click Save to save all the files for the project. Note the option to Create directory for solution. The DLL is ready for compilation. Click Build|Build Solution or press F6. However, the DLL does not have any methods, properties, or events to expose; therefore, there is little point in creating the DLL at this stage. Note that the code in this file is auto-generated from the configurations set using the graphical user interface dialogues. The DispId attributes must be unique integers. Events are declared in the public interface UserEvents block and methods and properties are declared in the public interface _Demo block. At this point, a C# language manual is necessary in order to be able to build reasonable functionality in the DLL. The location will vary depending on the specification for Location; see Figure 7. The DLL’s properties can be examined by collating it within the filing system and clicking the right mouse button: see Figure 8. Ensure that there are no existing sessions of a client that will use the DLL. Ensure that it has the .Net Framework 2.0 installed already. Copy the DLL to a target computer at any suitable location. In principle, it is inadvisable to copy the DLL to a system folder such as System32; a good location is the folder housing the application that will deploy the DLL. For the purpose to hand, the DLL is copied to C:\MY APL APPLICATION. In order to make the DLL available, click Start|Run to display the dialogue shown in Figure 9. The code in the box shows the fully qualified name of REGASM.EXE followed by the switch /codebase and then the fully qualified name of the DLL. The file locations vary on your computer. At this point, the DLL is available on the target computer and is readily deployed by APL. Using APL+Win, an instance of the DLL is created as shown in Figure 10. Using APLX, an instance of the DLL is created as shown in Figure 11. Using Dyalog, an instance of the DLL is created as shown in Figure 12. APL+Win and APLX are consistent in the enumeration of the events, methods, and properties of the DLL. However, it is unclear why Dyalog is unable to see the event. The property MyProperty is a read/write property that is numeric. There appears to be an inconsistency! On closer examination of the code, it is apparent that the DLL coerces the value of the property to integer; hence, the result is 101 instead of 100.75. The event handler did fire and ran the APL handler; any APL+Win function may be called by the handler. The method eventm also raises the event MyEvent. Finally, the method MyMethod takes a single argument and returns it incremented by 10. Although the methods, properties, and events in this demonstration C# COM DLL are simple, it is clear that it is now possible to write COM servers in the Microsoft flagship language, C#, for deployment with APL. Moreover, the template developed in this article for building and deploying such DLLs is minimalist, as would become clear from a study of the subject. For instance, I have completely circumvented the issues relating to strong names, the Global Assembly Cache and the debate related to managed code. 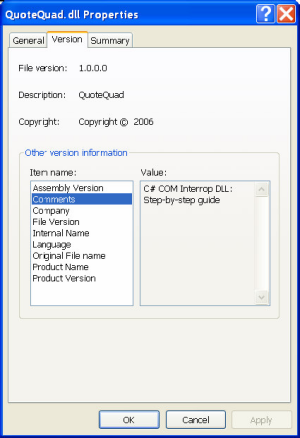 The source code for the DLL is included in qq.zip, as is quotequad.dll. The next step is for you to replicate the whole demonstration for yourself, using the source code, and then to write more purposeful methods and properties. In order to accomplish this, you will need a good reference on C# and an understanding of the conventions relating to COM objects. Also, use the quotequad.dll to test the deployment technique discussed above.